With the success of the male Trenchie coat series, fans can't get enough of the high-fashion gunslinger series! 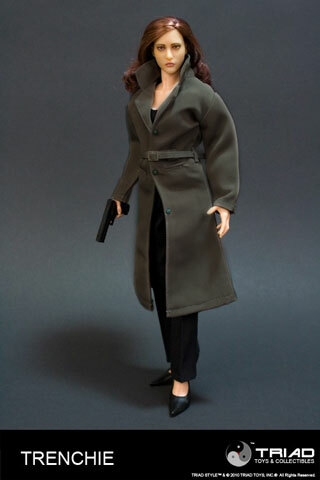 Whether it's a private detective, a military officer, or just some high-flying action gunslinger, the Trenchie coat set is perfect for that figure! This particular set, like its male version counterparts, are made of nothing but the finest fabrics. Luxury grade canvas and broadcloth makes this set a finely unique piece. The material is thin enough so it does not look like a toy, but sturdy and textured well enough that it would look like something you would wear. The tailoring, as you can see from the photos, are just what you have come to expect from Triad Toys. Please note the boots and other clothing items are not included and are available separately thru our store. Most outfit sets are made to be customized so they are sold separately.